Her latest top picks, favorite cheeses, and most expensive meal memory. 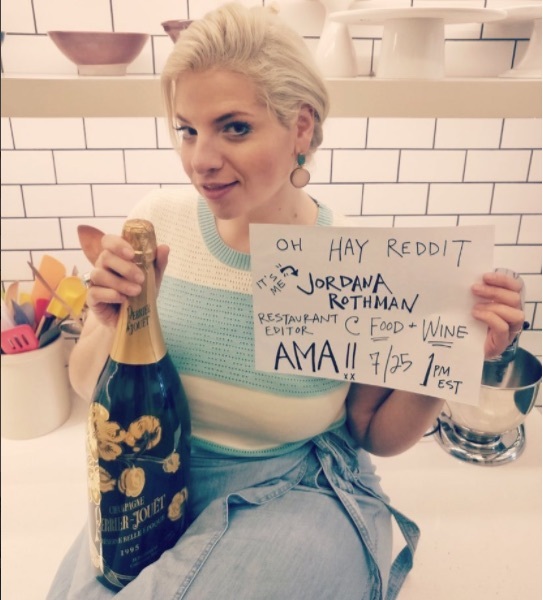 Earlier today, Food & Wine Restaurant Editor Jordana Rothman took to Reddit for an AMA—and answered some of the internet's most pressing food and restaurant-related questions. Here are some of our key learnings from the Q&A. What do you think is going to be the next food trend this year? Some of the chefs I'm most excited about right now aren't working in a traditional restaurant setting. People like Oona Tempest at Sushi by Bae, Brandon Baltzley at Buffalo Jump and Chad and Chase Valencia from Lasa in Los Angeles. So I think we're going to see more of this free form creativity continue to take shape over the next year. Best dessert you've had during all your travels? I will forever be haunted by the memory of the uni ice cream sandwich at Otoko in Austin. Yoshi Okai was one of our Best New Chefs this year, and that's a great testament as to why. What is the best restaurant in America (in your opinion)? The best restaurant is the right restaurant for the moment, so sort of impossible to answer. I think the most ambitious restaurant in America right now is Jordan Kahn's Vespertine in LA. He comes out of the Alinea kitchen, so he's in that dreamy, imaginative space. But the restaurant I visit the most? Probably Frankie's 457 in Carroll Gardens, Brooklyn—to me, the platonic ideal of a neighborhood restaurant. What do you think about Instagram's impact on restaurants / food culture in general? Has it also changed your work? Instagram and other social platforms have definitely altered restaurant culture. In general I think it's a good thing, I'm always going to be on the side of anything that gets more people more psyched to eat in more restaurants. It can occasionally be intrusive in a dining room setting though, and many chefs have mixed feelings about it. My bud Pete Wells wrote a great story about the IG-ification of plating that you might want to read. As to how it's affected my work, when people follow me on IG (@jordanarothman) they are mostly doing it to see where I'm eating. And so I feel more pressure to deliver on that and less free to share glimpses of my personal life. Are you my mommy? Years ago, the first time I tasted Tomme Crayeuse, I thought that was the very best cheese. I tasted it at a long closed restaurant after hours with an old school chef named Wayne Nish and I felt like it was revealing its secrets to me as I ate it...like it trusted me more with every bite or some such icky metaphor. But lately I've been really into Vermont Creamery's St. Albans—their domestic version of the French St Marcellin which you can only taste in the U.S. if you're brave enough to smuggle it home. So yeah. Those cheeses. What are some second or third tier cities across America that people would be surprised by, re: the food and restaurant scene? Love, love, love this question. I am so lucky that I get to travel all over the country in search of the Food & Wine Best New Chefs, and I take particular pride in celebrating ascendent food scenes in cities you wouldn't expect. There is a huge amount of action in Detroit right now, thanks to the efforts of a bunch of young cooks with a lot of civic pride. I'm especially excited for George Azar to reopen Flowers of Vietnam this fall, and Kate Williams who is opening Lady of the House in Corktown. I also had some great food in Cincinnati, especially the stuff Ryan Santos is doing at Please. For every transcendent bite there are many I'd rather forget. But I will say there is one flavor I completely loathe and my heart sinks when I see it on the plate: roasted red pepper. Maybe a hot take but yeah, I'm gonna go ahead and say bell peppers in general don't deserve their place in the produce aisle. Spicy peppers or no peppers says I. Hey Jordana I was just wondering how you got started in your profession? And stipulations of your job, I want to eat at the best restaurants! Did you start as a Writer? A chef? Something else? I definitely didn't grow up wanting to be a food writer. I don't come from gastronomic stock, my family is pretty classically suburban when it came to their diets. Like a lot of Americans, my meat arrived on a styrofoam tray, divorced of any evidence of the beast that gave its life for it. When I was just out of college I happened into a job writing chef bios for a food PR firm. I only worked there for a year but it left its mark—I got to spend time in professional kitchens for the first time in my life, and I just loved the spirit and edge of that world. That turned into freelancing and freelancing turned into an editorial assistant job and within a few years I was editing the food section at a weekly magazine in New York. What's the most expensive meal you've ever had and was it worth the splurge? One of the most expensive meals of my life was at Blue Hill at Stone Barns. It's a serious investment in a lot of ways (the currency of time cannot be understated). But it was also absolutely worth it. Not only because it was delicious and educational and a magical experience from a service perspective, but also because I like to think my dining dollars send a message about what's important to me—I want to support the agricultural mission of a place like BH@SB, and so I'd happily spend it again. Standing on my head, wearing a leotard.